You are here: Home News & Blog Airedale continues to expand onto Continental Europe! Airedale continues to expand onto Continental Europe! 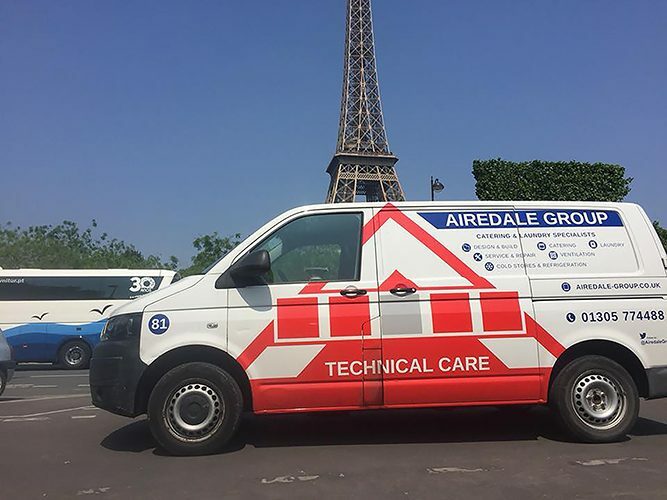 This week saw our continued expansion onto Continental Europe, when a team from both our Airedale Building Services and Airedale Technical Care divisions travelled to the beautiful French Capital Paris. This follows on-going work for our specialist projects and manufacturing divisions Airedale Catering Equipment and Caterform as far afield as Milan in Northern Italy. The visit to Paris was primarily to utilise our commercial catering engineers’ expertise, to repair another contractor’s faulty installation. We also visited a new site for another Key Account that has expansion plans into Europe. These projects further illustrate our commitment to offering our clients the very best service no matter where they are located; we go the extra Kilometre as well as Mile for them. If you also have either existing sites on the Continent or have plans to do so, contact us today for expert advice and assistance. We look forward to working with you soon.